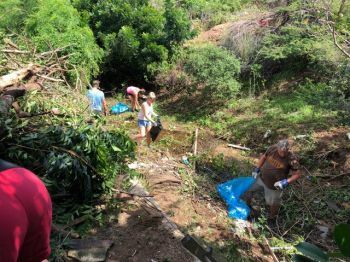 The venture was made possible through a joint initiative between UniteBVI Foundation, the Branson family foundation based in the Virgin Islands and the Ministry for Education and Culture. According to a release by the UniteBVI Foundation, dated November 27, 2018, a small ceremony was held on Tuesday, November 13, 2018, hosted by the Ministry for Education and Culture, which marked the onset of the construction phase of the development process. Also in attendance was Flow’s Country Manager, Mr Colin MacDonald, representing the Cable and Wireless Foundation, who generously contributed a $100,000.00 donation to the project facilitated by UniteBVI. 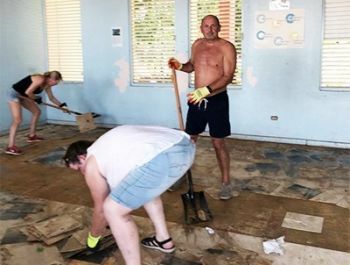 Following the devastation of Hurricane Irma, just over a year ago, 80 per cent of the Schools in the VI were completely destroyed or severely damaged, ultimately affecting the very core structure of the VI youth’s education. Sir Richard Branson, during the ground-breaking ceremony, spoke of the trying times experienced after Hurricane Irma, and how the Unite BVI team have been working to serve and unite people within the community. “Virgin Gorda, like the rest of the Caribbean, suffered tremendously, but as a result people have united and come out of the situation stronger. I am excited to be here today, to add to the recovery process of the Virgin Gorda Community,” said Sir Richard. The day concluded with achievements in debris clean up across the BFEC property including four skips of debris removal from the back ghut, clearing out of three classrooms in Block 1, completion of a fence around the Green VI Community garden, painting of the Green VI new office container, cleaning and painting of a shade sail for the primary courtyard and needed repairs to the Early Childhood Resource Centre. what they up to now? @blindman doing what you and other BVislanders should be doing! Oh wait Richard have be-longer status. He’s doing his part as local what about you? Thank you for all the help. My question is: why are the students not helping too?